A Strawberry Shortcake has the classic combination of biscuit, fresh strawberries and cream, that never fails to delight. This is casual food at its best, which we love to eat during the summer months at backyard barbecues and other informal gatherings. For this Strawberry Shortcake we start with a cream scone. This is the perfect scone for absorbing all those wonderful strawberry juices. It has a rich buttery flavor, crisp exterior, yet inside it is so light and fluffy. A few things to keep in mind when making scones; always have the butter cold, add the liquid to the dry ingredients all at once, and mix everything together quickly and lightly. Of course, having the scones come out of the oven shortly before assembling the Shortcake would be ideal, but not very practical for most cooks. So, my advise is to make the scones the day they are going to be served and if you want warm scones, simply reheat in the microwave. Next, the strawberries. Always buy strawberries when they are in season. Look for ones that are bright red, plump, and firm, with no white or green "shoulders" at the stem end. The green leaf-like cap or hull should still be attached and it should not be brown or wilted. There should be no soft spots, bruising or mildew. Always check the underside of the container to make sure there are no squashed berries or juice (sign of overripe berries). If not using immediately store in a single layer on a paper towel-lined tray in the refrigerator for a couple of days. About an hour before assembling the shortcakes, remove the stems from the berries and lightly wash them (do not soak). Cut or slice the berries into bite size pieces and place about one third of the strawberries in a large bowl and crush them with a potato masher or fork. Add the remaining sliced strawberries, along with the sugar. Set aside to macerate at room temperature for about 30 to 60 minutes as this will soften the berries and allow them to release some of their juices. And finally, the Cream. Cream is the fat that rises to the top of whole milk. It has a smooth, satiny texture and is labeled according to its butterfat content (heavy to light). 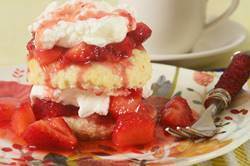 When making Shortcake use 'Heavy' Cream or Heavy 'Whipping' Cream which means it has a 36 - 40% butterfat content that will double in volume when whipped and hold its form. Because of its superior flavor, I recommend using an organic brand of heavy whipping cream. My directions for whipping the cream are slightly different than most recipes. You need to first mix together and chill the whipping cream, vanilla extract, and sugar before whipping. This method will let you store the whipped cream in the refrigerator for several hours without it deflating. Scones: Preheat oven to 375 degrees F (190 degrees C) and place rack in middle of oven. Line a cookie sheet with parchment paper. In a large bowl, whisk together the flour, sugar, baking powder, and salt. Cut the butter into small pieces and blend into the flour mixture with a pastry blender or two knives. The mixture should look like coarse crumbs. Whisk together the egg, cream and vanilla extract and add to the flour mixture, mixing just until the dough comes together. Do not over mix the dough. Transfer to a lightly floured surface and knead dough gently four or five times and then pat or roll the dough into a 7 inch (18 cm) round. With a 3 inch (7 cm) round cookie cutter, cut out rounds and place the scones on the baking sheet. Brush the tops of the scones with a little cream. Bake for about 15 - 20 minutes or until nicely browned and a toothpick inserted in the center of a scone comes out clean. Transfer to a wire rack. Filling: Wash, hull, and slice the strawberries. Place about one third of the strawberries in a large bowl and crush them with a potato masher or fork. Add the remaining sliced strawberries, along with the sugar. (The amount of sugar used will depend on how sweet the berries are.) Set aside to macerate at room temperature for about 30 to 60 minutes. Whipped Cream: Chill the bowl and whisk in the freezer for about 15 - 30 minutes. Place the cream and sugar in the bowl and whip until stiff peaks form. The whipped cream can be covered and stored in the refrigerator for a few hours. To serve: Cut the scones in half and place the bottom half of the scone (soft side up) on a dessert plate. Top with some of the strawberries and whipped cream. Place the top half of the scone on the strawberries. Top with whipped cream and a few more strawberries. If there is any juice from the strawberries, drizzle a little over the top of the scone. Serve immediately.